Drybone (ドライボーン [drybone] in Japanese) is an area in eastern Thanalan. It gained its name from its extreme heat, in which the bones of those who die of thirst there are bound to very soon be bleached by the relentless sun1. To its east can be found the Yugr'am River and beyond it Wellwick Wood (2.0+ only, Wellwick was considered part of Drybone before the Calamity and Yugr'am didn't use to pass through the area), to the south-east Burning Wall and to the south-south-east Sandgate. 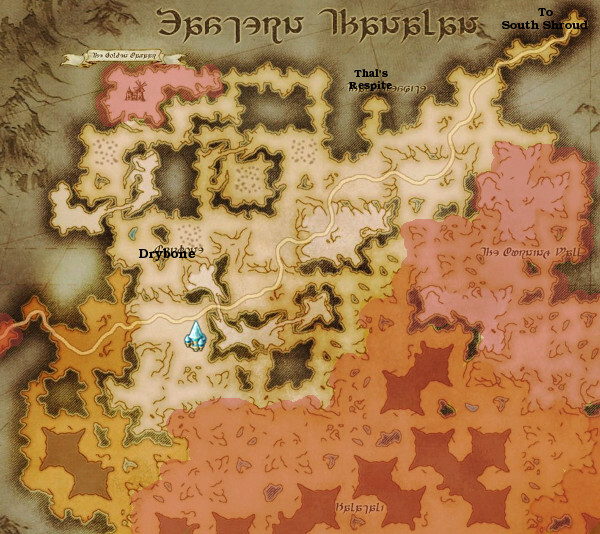 In version 1.x, the area south of Drybone was known as Halatali, but post-Calamity that area was retconned into Sandgate and Halatali came to refer only to the fighting area found within the caves there. Further south from Sandgate/Halatali is the way to Broken Water, and to the west of Drybone lies the way to Black Brush. Drybone is a central area to life in Thanalan, and must be passed through when traveling between Ul'dah and Gridania on the Royal Allagan Sunway. 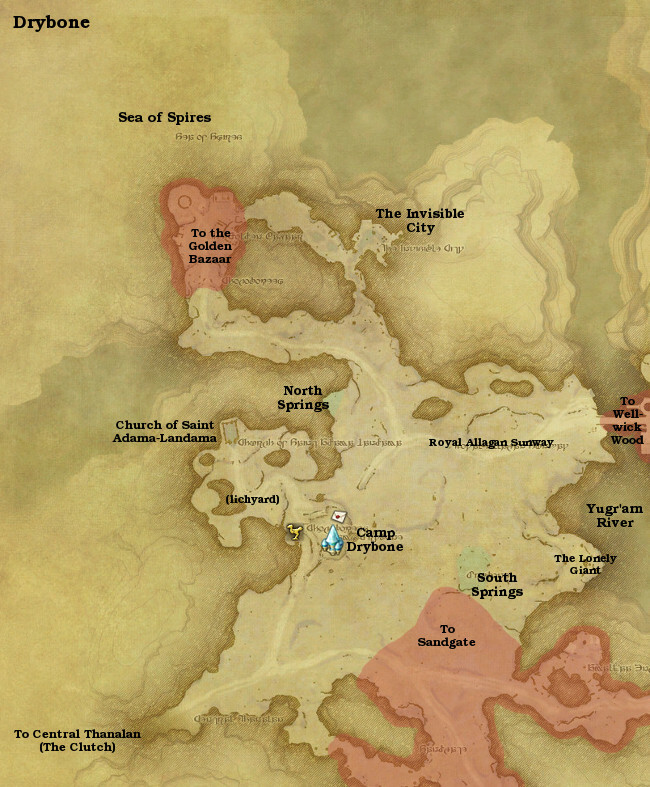 The village of Golden Bazaar can be found in the north-west, beyond which is the Sea of Spires. Before the Calamity, the Mythril Pit T-8 could be found on the border between Drybone and Halatali, but has since disappeared, its fate unknown. Since the Wellwick Wood area was part of Drybone itself in version 1.x, Thal's Respite could be found here as well. Camp Drybone (キャンプ・ドライボーン [camp drybone] in Japanese) is a waypoint settlement that serves travelers of the Royal Allagan Sunway and those who arrive by aetheryte. Its main features are inns, taverns and stalls of merchandise. Due to its proximity to Amalj'aa-controlled territory in Sandgate, a contingent of Immortal Flames is permanently stationed there. The Church of Saint Adama-Landama (聖アダマ・ランダマ教会 [sei adama-landama kyoukai] in Japanese) is a new establishment dedicated to Nald'thal, built in the immediate aftermath of the Calamity to care for the multitudes of masses that died in it. It was commissioned by various merchants of Ul'dah, and named after the Saint Adama-Landama. An extensive lichyard surrounds the small church itself, and more graves are added almost daily as the poorest people in Thanalan make their way to it to get their loved ones buried in a way that doesn't completely bankrupt them. The Invisible City (見えざる都 [miezaru miyako] or 'unseen city' in Japanese) is a collection of ruins that had long been buried under what amounts to almost a malm of solid rock. The Calamity revealed them however, and their presence has brought much scholarly interest in the lagging region. It is unclear just how extensive the ruins are, but their presence is confirmed in the main area (marked on the map as 'The Invisible City') as well as in the newly-rent gorge that now houses the Yugr'am River. What was initially thought to have been an ancient city now seems to be turning out to be an ancient gigantic tomb, that of sultan Lalafuto IV of Belah'dia to be exact. It is unknown just how long they were hidden, but as Lalafuto III is known to have ruled in 871, that gives an approximate maximum timeline of 600-700 years, and the tomb must have been buried for almost as long for there not to have been any word of it that survived to the present day. The Lonely Giant (グゥーブーの骸 [goobbue no mukuro] or 'corpse of a goobbue' in Japanese) is the corpse of a large goobbue covered in various flora. It is theorized that the goobbue ran south all the way from Carteneau Flats, driven wild by the events of the Battle of Carteneau, picking up seeds native to all the areas it passed through. In Drybone its strength finally gave out and it died where it stood, leaving behind a fertile place for all the seeds to sprout. As a result, the Lonely Giant is a botanical marvel the likes of which is not seen anywhere else in Thanalan. In an out-of-game context, the Lonely Giant is most likely a reference to the 'Goobbue Wall of Ul'dah'. In the final days before the servers shut down at the end of version 1.x and the Battle of Carteneau happened, some players took to 'defending' Ul'dah from rampaging high-level monsters that had appeared everywhere by calling their goobbue mounts and forming a defensive line in front of the Gate of Nald. Note that no actual quests started in Drybone in version 1.x.